Nice to see some new pictures. Looking good Rich. I have also updated my page today. The box is almost finished and the neck is roughed out. I have some nice pictures showing my Taylor-inspired neck attachment that I am really proud of. Your project is coming along nicely Peter. I like that neck joint nice and straight forward. I have become a fan of making the neck fully modular, and not glueing the fretboard to the soundboard (just makes good sense to me). How are you doing on your back? I am working on mine at the moment. Had a little delay in deciding on backstrip material (I am bad about making those choices ). I’m keeping the look really simple. Sitka top, mahogany for back, sides and neck, ebony bridge, fretboard, bindings and a Richard Schneider inspired soundhole rosette that rests “on top” of the top and the back has no back strip at all (OK, and a wine inlay for the fretboard, gotta have something pretty to look at…). Only those three colours, Sitka, mahogany and ebony. That keeps the amount of decisions down. I’m doing an X-braced back and that was glued up yesterday. Why X-braced? I just thought that it would help keeping that domed shape better than the traditional ladder bracing. - I come from electrics. I like the idea of being able to work with thin shims if things don’t really work out like they should, or if the guitar need a neck reset in the future. - I saw the Taylor neck joint at Frank Fords www.fret.com There he stated that it was only good for high tech production builds. So I had to do it to prove to myself that it actually could be done. And I read something Mattia wrote over at MIMF about him not gluing the fretboard overhang to the body. He said that it worked fine. I will start without glue and see what happens. Peter-I think the bolt on makes good sense given that future neck re-sets would be much easier. It would be quicker to glue the neck, but the extra effort will pay off IMO. As far as the fretboard. I have talked to guys that glue lightly w/ epoxy, some that titebond, some that us nothing. It is an area prone to seperation if you glue anyway. With your design you have a good extended neck to glue to so you won't have a lot of overhang to deal with anyway. Keep up the great work man! I updated a few pictures. I finished up the backstrip (I went for Satinwood and Bois de rose)*pics. I made my back bracing, attached, carved *pics. I cleaned up the inside of the box and added side stiffeners *pics. I fit up the neck and drilled and added inserts and dowels/screws *no pics just yet. The back is glueing up right now, and I will shoot pics after I route the edges clean (hopefully tomorrow). I am going to start bending the sides for #2 and binding. I will focus on the necks as soon as time permits. I plan to get started on my acoustic soon, rich. I'll put up an album when I get rolling. I hope to start on the molds for the side bender this week. Oh my Rich! You have definately out-done yourself with that lamination area on that curly claro back!!! Wow! I've been trying not to clutter up this thread with too many praise posts, but I can keep silent no longer. Rich, that looks so clean! Great, great stuff! Russ, Very cool. I am exited to see how you like making acoustics. Chris- Thanks mister, I did a little test sample (shellac) with the Bois/Satin Wood/Claro and I think the gold, dark burgany and Claro look nice. You know how much I aggonize over accent wood selection (hardest part of the build if you ask me ). Lance- Nice to hear from you man. I am trying to keep it clean. I trying to learn and get better with each new build . P.S. I know my pictures and descriptions of how I am doing things are not as good as I had originally wanted them to be. If anyone wants more info or needs better pictures on any of the processes I am using (or any of the other guys building their acoustics) feel free to ask. I was really hoping this thread would clear up any grey areas for guys wanting to build an acoustic. Don't worry about your cleanliness, rich. Your work is looking pristine. Put a semi gloss finish on it and I'll be in love. I think I'll like building acoustics a lot. At the moment, the only thing that churns my stomach a bit is the whole neck fitting/attachment deal. I'm pretty eager to dive into making the soundbox, it looks like a lot of fun. I ordered some more literature from stewmac today, to gain yet more insight. Wouldn't want to be ill-prepared. Oh, and I was wondering if you're planning on shaving those back braces down a bit. They look meaty to me, but my $.02 isn't worth anything, haha. Russ, Thanks for the nice comment . You are smart to pay close attension to the neck fit up. If you pay attension to fit and angle during the block/heal/rim construction you will save yourself a LOT of troublesome adjusting. As far as the back bracing. Pics are probably deceptive, and don't tell the whole story. Since you bring it up. I want to through out a few of my thoughts, and hopefully some of the other fellas will add their comments also. Some things are not really obvious when looking at a picture of bracing or evaluating shape/mass/design. First is the thickness of the soundboard or back. Reducing thickness reduces overall mass very quickly compaired to shaving or drilling braces. As an example, based on my body shape and generic X bracing. .085" thick- 20.57 cu. in. now take typical X brace configuration .25" wide and .375" tall. Square no carve- about 5 cu in. average fat carve and shape(reduce 50%) 2.5 cu. in. Point here being thickness of the soundbaord makes a very big difference, and overall mass of bracing is small by comparison. Of course stiffness of material plays a huge role in how thin you can go (hence the focus on stiff strong soundboards). Backs of course use some very stiff materials such as Maccassar, Cocobolo and so forth. The thickness can be much more variable with all these different hardwoods (as well as denisty being very high compaired to typical bracing materials). When carving and shaping design plays a huge role also in terms of what carving is needed. Also where the forces you are bracing against and where you want more flexability come into play also. How close the brace is to a rigud or slightly rigid element(such as tail block, neck block, side kerfing), or lack of any support (soundholes) must also be brought into the mix. I have a few rules of thumb I use when carving (as I am sure most people do), and from there I carve only till the board tells me enough. I have had a real hard time getting use to things like cross drilling. Mainly because it does not seem to remove hardly any strength ( choose a width that is close to what anticipate final width should be, otherwise you will be creating very steep tapers due to limited ability to scallop). Hey Rich, what are those holes in the heel block (attached to the soundboard)? Used for neck attachment? Erik, Yes that is what they are for. I attached the neck with one bolt and too some shot just to make it easier to see what I am up to (the neck is dead ruff shaped- so keep that in mind). I took a couple pics of the back (attached), and of course the pics w/neck. Rich, when you say “cross drilling” do you mean drilling holes in the main core of the brace? I’m pretty sure that it is to remove weight not for adjusting strength. For a thought experiment we can compare the brace to one of those steel beams that are used in construction. The web is thin and only has one purpose. To hold the upper and lower parts (have no idea what that is called) together and not allowing them to move in relativity to each other. Back to the braces. The web is the centre part of the brace and if you drill reasonably sized holes it them you can do the same thing as with the steel beams, save a lot of weight. But if it is right as you said (and I have NO reason to doubt that) there is much more weight in the top itself compared to the braces. Don’t know if you must be logged in to see the thread, but if so it is well worth the time to register. MIMF has a lot of info about acoustics. Love to hear your guitar when it is finished, Rich. Looking very good this far. I will read through the thread when I have a bit of time. As far as tap tuning. You are right in thinking it changes radiacally when you attach it to the rim or stress it. I tap to reference the board itself . In terms of what I think it should sound like (balance and such). I also want a certain flexability or looseness to the board, this is to allow for the board to tighten back up where I want it. All this is done by feel from what I have done in the past (right or wrong/ I will only know when it gets strung up). I am not sure if there is a magic bullet or test out there. Soundboards are so very dynamic. My notes, what little experience I have and doing my best to use that info and experience is about the best I have right now. Long time no post. I have completed the wild asymmetrical acoustic guitar at last. The result is a wonderfully balanced guitar with some serious volume and projection. I am very pleased with the results of this one. There are some unconventional concepts at play in the bracing, especially the top. I do think that the carbon fiber rods are a great idea for string tension transfer to the sides. It stiffens the whole side assembly immensly. This redirecion of stress allows the top to be braced more lightly then before. The double x-brace is still standard thickness but the rest of the braces are lighter. The finish is Tru-Oil. Yes, even on the top. And you know what? It sounds great. 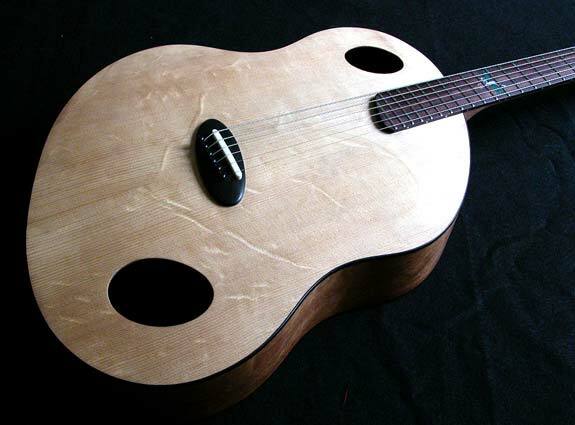 Of course there is much speculation on how oil affects the resonance of an acoustic top. I didn't lacquer it first and then remove the finish and put the oil on so I have no way to compare the results of one over the other (it is my guess that no one who condems oil has done this either). The guitar has so much sustain and the harmonics jump right out of the guitar. Of course the old spruce and mahogany might have something to do with it. I cannot tell any difference from oil to lacquer except for softness of finish. I still recommend lacquer for the top but this was a client request. Great results overall for such a wierd design concept. I am pretty pleased. It shipped this afternoon to Seattle, WA. Home to the mother tree. Great looking guitar! My compliments to the monkey that made it . The design is so far off the norm . From the unique shape. The soundholes above and below the bridge. The carbon rods to the sides. Short heel on the neck. You definately have me thinking about adding stiffness to my sides. Jammy by name, Jammy by nature! The lack of heel is ACE! I'm considering attempting something similar on my next guitar - do you have any pictures of the un-assembled joint? I agree that side stiffness might be a very good thing. The less vibrational energy that gets absorbed by anything other than the top the better, it seems. Maybe laminated sides might also be a good thing. That woudl be way stiffer. And a laminated, brace free back like the Smallman classicals? Who knows what will come out of the laboratory next? do you have any pictures of the un-assembled joint? No I don't. I is a simple neck pocket like a solidbody electric. You just need to make the neck block thick enough to accept the neck heel. Very nice David. I especially like what you did with the bridge. For the neck, did you go with a set neck, or bolt on? Thanks. I went with a set neck on this one. It works pretty well and as you can see there is plenty of room to work with on that saddle. It sits up pretty tall. Of course the neck can be steamed out if necessary in the future just like a dovetail (only easier). If I were to make one for myself I probably would use bolts for the neck attachment. That is amazing David. I would love to hear some sound clips! That's some beautiful curly claro Rich. And you know how big a sucker I am for that . But I've gotta ask... what's the build theory behind the almost tuning fork style shape at the end of your neck, and also what are those bolt like things there for too? Yes, I know you do like that Claro . If I am understanding what you are asking about. That tuning fork thing is truss rod access(bear with the way the neck looks it was pretty much ruff in those pics). Those bolt like things are threaded inserts. The neck is atteched by two 1/4 x 20 bolts (inserts in the heal) and (4) #10 threaded rods with threaded sleeves(aligning the rods from neck through the neck block) each being nutted from inside the body. I am very happy with the fit and how well it aligns( four in the top position may have been overkill- two would have done just fine). The use of threaded rod(removable) and inserts will allow for accurate shimming with little effort if ever needed. Sound clip would be GREAT for that crazy guitar!! Here is my guitar blog. - Its mainly a personal BEGINNERS RANT, -Best thing on it so far is the very temp adjustable glue pot made from a garage sale fondue pot I got for $5.00 and an olive jar for the hide glue. Welcome to the group! I will add your link to the first post with the other links. I read over your blog.Seems like you are moving forward. It would be great to see some pictures.